Previously parquet was only really found in older period properties and was a sign of opulent wealth. Skilled craftsmen would individually cut small pieces of wood and lay them in intricate designs. Whilst the result was beautiful, it took a lot of time and cost a lot of money. However since 2014, the flooring industry has started to pick up on this trend and there are now far more options. Whether you stick with traditional wood or venture towards luxury vinyl tiles, we have something to suit any of your ideas. Traditionally parquet was a fussy design, as mentioned above it was normally a small intricate pattern. 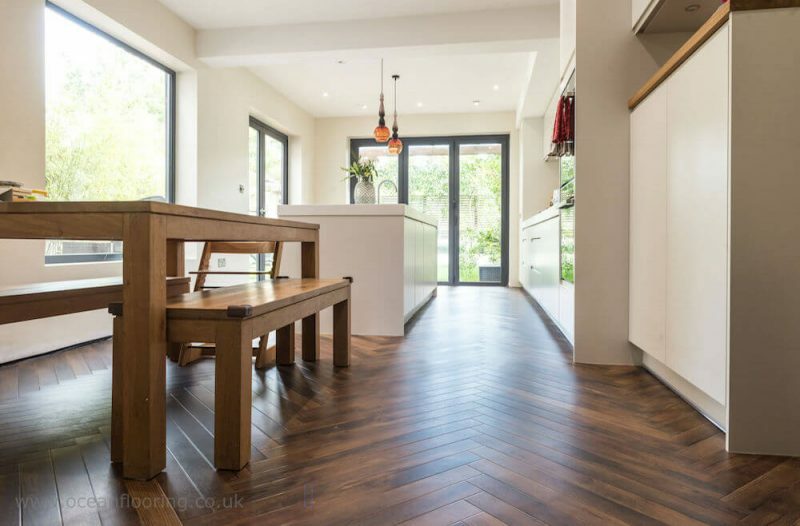 However the current trend is for longer planks laid in a Herringbone pattern. In the last year, we have seen a huge rise in enquiries for this style of floor. 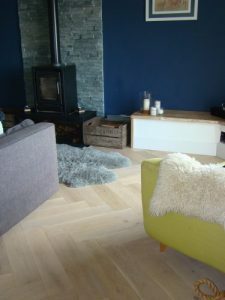 Add in the UK obsession with Hygge and everything Scandinavian a couple of years ago which saw an increase in the amount of “scandi white washed” wooden floors we were installing. This colour scheme combined with a herringbone design gives a contemporary yet warm feel to any home. Wood or Luxury Vinyl Tile? Parquet flooring in white oiled oak. However if maintaining a wood floor is not your thing, then perhaps luxury vinyl tiles is a better choice for you. Companies such as Amtico and Karndean have really nailed the parquet design. They now offer planks in a huge variety of colours as well as laying styles. Whilst more products have come onto the market making it more affordable than before, what is paramount to the finished look is the skill of the fitter. We are therefore incredibly grateful to our team of fitters who we can safely say excel in fitting this type of floor. 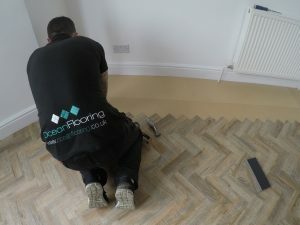 For 5 months now a number of our team have been fully booked fitting just parquet. Gary fitting a luxury vinyl tile in a chevron design. The preparation work and initial layout is key to the end result. Both our estimators and fitters like to go through with the client how they envisage the finished floor. We discuss which way the patterns should go, how this links in with other rooms etc. Without doubt, the more thorough the initial consultation and the preparation, the better the finish. So we are now four years down the line from when we predicted this trend. We have become experts within this field and can say this trend won’t be going anywhere soon.